Home » SHARITARISH a Pawnee Chief. SHARITARISH a Pawnee Chief. American native. THE Pawnee nation is divided into several parts, the original or main body of which are called Grand Pawnees, while the bands which have separated from them, and form independent, though somewhat subordinate communities, are designated as Pawnee Loups, Republican Pawnees, Pawnee Mahas, &c. These divisions of larger into smaller communities, which are continually taking place, present a curious subject in the study of Indian history, which we propose to treat more at large in another place. Sharitarish was principal chief, or head man of the Grand Pawnees. He was descended from a line of chiefs, and according to the law of descents, which selects the next of kin, if worthy, succeeded his elder brother, Tarecawawaho. They were sons of Sharitarish, a chief, who is mentioned in Pike’s Expedition under the name of Characterish. 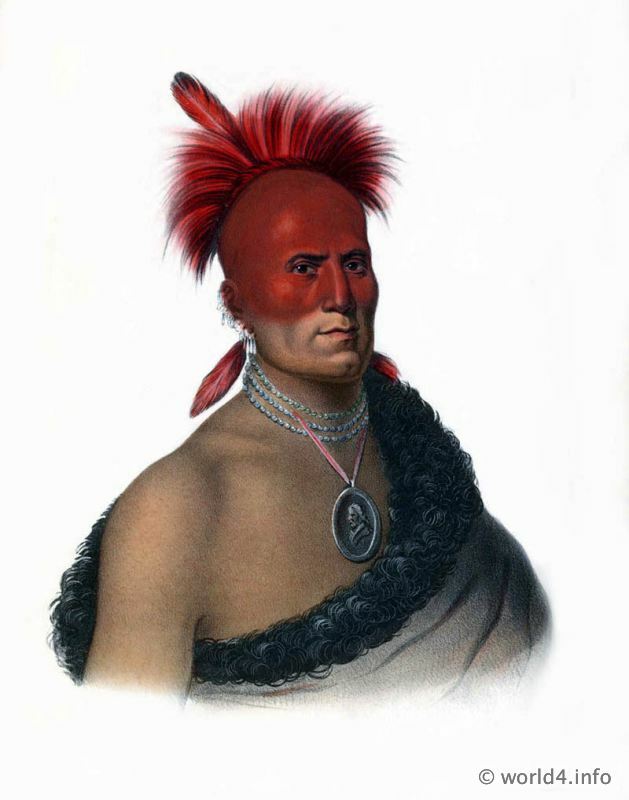 Tarecawawaho was a brave and enterprising leader, as indeed those usually are who obtain power in these warlike tribes; for the office of chief is no sinecure among a people so continually exposed to various dangers. He had also a large share of that pride, the offspring of ignorance, which is often the principal ingredient in the magnificence of sovereignty, and especially in the savage state. When invited to visit the President of the United States, he refused to do so, upon the ground that it would be too great a condescension. The Pawnees, he asserted, were the greatest people in the world, and himself the most important chief. He was willing to live at peace with the American people, and to conciliate the government by reciprocating their acts of courtesy. But he argued that the President could not bring as many young men into the field as himself; that he did not own as many horses, nor maintain as many wives ; that he was not so distinguished a brave, and could not exhibit as many scalps taken in battle; and that therefore he would not consent to call him his great Father. He did not object, however, to return the civilities of the President, by sending a delegation composed of some of his principal men; and among those selected to accompany Major O`Fallon to Washington on this occasion, was the subject of this sketch. Sharitarish returned with enlarged views of the numbers and power of the white men, and no doubt with more correct opinions than he had before entertained, of the relative importance of his own nation. As he travelled league after league over the broad expanse of the American territory, he became convinced of the vast disparity between a horde of wandering savages and a nation of civilized men, and was satisfied that his people could gain nothing by a state of warfare with a power so superior. Sharitarish was a chief of noble form and fine bearing; he was six feet tall, and well proportioned; and when mounted on the fiery steed of the prairie, was a graceful and very imposing personage. His people looked upon him as a great brave, and the young men especially regarded him as a person who was designed to great distinction. After his return from Washington his popularity increased so greatly as to excite the jealousy of his elder brother, the head chief, who, however, did not long survive that event. He died a few weeks after the return of Sharitarish, who succeeded him, but who also died during the succeeding autumn, at the age of little more than thirty years. He was succeeded by his brother Ishcatape, the wicked chief, a name given him by the Omahas, or Pawnee Mahas, and which also has been applied by some to the subject of this notice. This entry was posted in 1830, 19th Century, Native American, North America, The Indian Tribes, Traditional and tagged Native american dress on 6/24/13 by world4.